Cafe de Oriente is a traditional restaurant offering Spanish cuisine. The average price of a main course dish at the Cafe de Oriente restaurant is 25 euros. The average price of a 3-course meal at the Cafe de Oriente restaurant is 50 euros. Note that although GoMadrid.com strives to maintain all information about Cafe de Oriente up to date, the prices mentioned are only an indication and may not reflect the exact value of your meal. The Café de Oriente is a cafeteria and restaurant which enjoys a privileged location within the Plaza de Oriente, right next to the Teatro Real and facing the Royal Palace. This really is an incredible location, and made even more pleasant when sitting outside on the terrace, which is covered to protect the diners from the hot sun during the summer, and any possible inclement weather during the winter. This area is right in the centre of the old 'Madrid of the Austrias', the historic district of Madrid close to the Royal Palace. The restaurant itself was built on the location of the 17th Century San Gil Convent and today probably possesses the best views of any eating establishment of Madrid, and is a wonderful place to sit and people watch while you enjoy the spectacular Oriente Square. The menu is traditional Spanish cuisine with a modern slant, in which the select produce presents a culinary experience for the senses. Dishes include Duck's Liver Terrine, Sautéed Jumbo Shrimp with Homemade Pasta, Rockfish Confit in Almond Oil and Glazed Veal Sweetbreads with Veal Cheeks, as well as Apple Cake with Badiana Ice Cream. Additionally, a very well-stocked wine selection ensures that there is always the perfect choice available. Apart from the excellent dining area of the terrace, the restaurant has various private dining spaces with capacity from 6 to 72 guests, perfect for a group or business lunch. This establishment is open every day for lunch from 1pm to 4pm and for dinner from 9pm to 12am. You may consult the menu in English here. 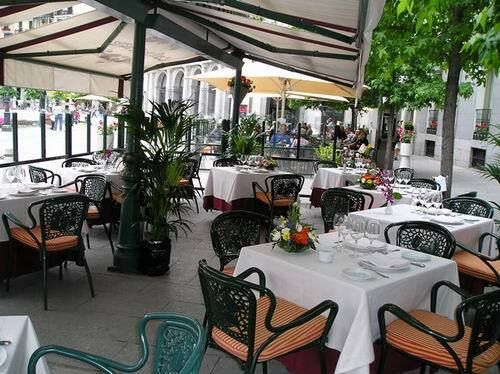 The address of the Cafe de Oriente restaurant is: Plaza de Oriente 2, 28014 Madrid. The nearest Metro station is Opera. Please see the Cafe de Oriente restaurant location map below.